Ballydavid in Ireland-South a perfect base for your holiday in County Kerry. Find out more about Ballydavid below. Just five miles from Dingle, and one hour from Kerry airport, this fabulously situated bungalow has sea views to the front and steep mountain countryside to the rear. Located next to a 12th-century church, one of Ireland's most famous archaeological sites, and Kerry Way walk, there is plenty to do nearby. The quiet fishing village of Ballydavid is three miles away, where you will find restaurants serving top quality seafood and pubs with great Irish music. Also nearby is a pottery, a cultural centre, and there are boat trips, one of which is to visit Fungie the celebrated dolphin.Shop 1 mile. Pub. Restaurant 3 miles. Beach 2 miles. GF: kitchen/diner, utility room, double, single, 6ft bed, reception room, bathroom with separate shower.Electricity and oil central heating included, open fire with starter pack, linen and towels included, No Smoking, TV, dvd player, radio, CD, freezer, microwave, dishwasher, w/machine, dryer, deck chairs, hairdryer, welcome pack, open plan partially enclosed garden, garden furniture, bbq, locked shed available for storage, off road parking. Sorry no pets. We have the following details listed regarding Ballydavid accommodation accessibility but we would recommend that you always confirm these prior to booking with the owner or operator. Ballydavid is a great base to explore the wonders of County Kerry and you will find plenty of activities near by. Ballydavid is at Dingle Peninsula, County Kerry. Check out the map below for directions, use the controls to zoom in. If you have stayed at Ballydavid why not add your thoughts, comments, pictures to our Facebook page? Don't forget to add the name/town/page link to your comment so its attributed to the correct place. Please keep it polite, we are sensitive souls! Find Cottage Holidays works closely with independent cottage owners and leading holiday travel operators to provide you the widest choice of self catering accommodation across Ireland. 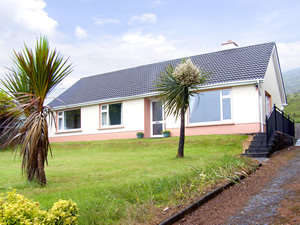 Ballydavid in County Kerry is available through: Imagine Ireland.